Utilising a solar powered 3G/4G-LTE internet connected system with a high end IP camera. The Commando is a 24/7 site monitoring tool that is ideal for multiple use applications such as uploading time lapse images to a web server while also providing a full online site monitoring tool that has images that can be available to many stakeholders or direct to the public. 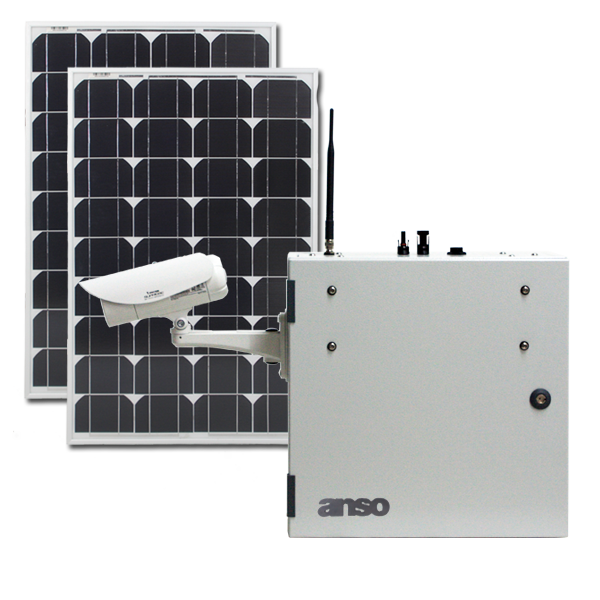 This system combines a 2MP HD quality IP camera with a 24/7 solar power system and a 4G internet connection to produce the ultimate fully stand alone camera system. These systems are used in applications such as asset monitoring systems, wildlife research and pest control, construction projects for time lapse recording, remote monitoring and online display of progress images. These systems can also be used for public infrastructure locations such as roads, railways, waterways and public places of interest as well as agriculture and mining applications. With the rapid development of wireless 3G and 4G broadband internet, supported by today's affordable solar energy solutions, these industrial grade camera systems can be rapidly deployed to any location. To compliment these technologies we utilise a premium high definition web camera with extensive multi-stream functionality. The quality of the camera and the images it produces revolutionises the use of webcam applications. Our camera systems can be accessed remotely for real-time live viewing via the mobile phone networks. In addition to this we also include a fully customisable image viewing website platform for viewing static images that have been uploaded by the camera. This is ideal for presenting images to a wide audience without needing to provide direct access to the camera. 100Ah battery included, (or supplied without battery for international customers). Industrial grade wireless 4G-LTE modem/router with fallback to 3G. Commando system suitable for 24/7 operation applications. For applications that only require 12 hour daytime operation please refer to our Sentinel range of systems. 1. High definition 1920x1080 px Multi-Stream Day/Night auto-iris outdoor camera delivering stunning resolution in extreme conditions. 30 frame per second full resolution streaming video (bandwidth and power permitting). The multi stream system will allow up to four different image/video streams with multiple simultaneous programmable events. Continue to automatically capture timelapse images and video motion detection events uninterrupted while viewing the live video feed. 2. Industrial grade 4G-LTE mobile broadband network modem/router with fallback to 3G for upload of images to your web server or email, as well as to remotely access the camera system, manage image capture, motion detection and image profile configuration and to retrieve internally stored images and video. 3. High gain 5dBi multiband low profile 4G-LTE/3G external antenna with operational bands of 700/800/900/1800/1900/2100/2400/2600 MHz servicing all global cellular frequencies for extremely versatile connectivity range. 4. Two high quality mono-crystalline solar panels. High efficiency, long life, heavy duty panel frame for exposed conditions with UV stabilised outdoor rated cables and connectors. 5. Microprocessor controlled power management and charging system. Three stage Bulk, Float and Absorbtion charging with internal LCD display of incoming panel voltage and current, internal battery voltage and average daily current and voltage input. 6. Second stage load timer to more efficiently manage internal power usage or limit times for internet connectivity. Industrial power resource reliability for long term time lapse projects and permanent remote monitoring applications. This system allows for the powering up and down of camera and communications within the unit while charging systems continue uninterrupted. 7 day fully programmable digital timer, with up to 8 separate programs per day and separate battery backup for complete program reliability. 7. Universal mounting brackets to fit multiple variants of U-bolts and brackets and can also be used for bolting directly into timber or can be clamped using threaded rod around a square pole. We can also provide customised mounting hardware to suit your application to attach the universal mounting brackets directly to your specific pole or structure. 8. External PV Connectors for the solar panel positive and negative leads to plug directly to the unit with IP67 rated outdoor weather resistant connectors. 9. Heavy Duty Steel Outdoor Enclosure with nylon seal washers. Filtered air intake (multi stage) with moisture catch chamber and easily changed internal filters. Optional keyed lock for improved tamper resistance. The integrated 4G-LTE/3G modem/router enables the system to be installed to any location where a wireless broadband internet connection can be accessed without the requirement of a fixed line internet service. Redeployment of the system is as easy as unmounting the system and remounting in the new location. Experience remote access monitoring with real-time live stream viewing from any internet connection utilising a dynamic DNS service to automatically stay linked with your dynamic system IP address. Remote access allows you to view the live video stream, modify event settings and system configuration or access the onboard SD card storage directly from your web browser. We will assist you to setup a Telstra Mobile Data Sim and configure your Dynamic DNS service as part of the system setup. Fully pre-configured and tested prior to delivery to enable you to simply mount the system and turn it on and achieve complete instant functionality. Upload timed sequential images directly to our web hosting servers via the wireless internet connection. We include 12 months of free web hosting per camera system which includes 3GB of disk space and 15GB of bandwidth per month worth $500 p/a. The multiple event settings in the camera allow you to also simultaneously upload a copy of all images to your own web server via FTP as well as store a copy of the images onboard the internal SD card. Set video motion detection triggers to record video to the local storage, while also uploading images to web for online viewing and sending email notifications with image attachements. The extensive versatility of configuration options with multiple simultaneous image/video streams and event settings makes these camera systems suitable for a wide range of applications such as construction time lapse recording, live remote project monitoring, online stakeholder involvement, remote research and environmental projects, government infrastructure monitoring, waste dumping prevention and offender identification, remote security monitoring, bush fire and flood warning systems, remote farming and crop management or tourism promotion such as online snow and beach cameras. To enable a fully self sustainable system we have incorporated a solar powered battery and controller system to recharge the battery during daylight hours while the camera and system is in operation. This is an ideal solution for remote location monitoring where access to an existing power source may not be available, prove to be excellent for situations such as green field construction projects or where a camera position may need to be altered periodically without needing to relocate the connection to a power supply. Eliminating the need for connection to an existing power source reduces the logistics and expense of organising power to your camera location and in many cases makes it possible to deploy a remote camera system to remote locations where power is simply unavailable. Included with every camera system is a Website Image Viewing Platform pre-installed on your free web hosting account for 12 months. This will automatically load your latest images into an easy online viewing interface behind a secure login. This is a fully functional CMS website platform customised for image management. Ideal for easily viewing images from multiple cameras and for displaying a sequence of images to multiple online stakeholders. 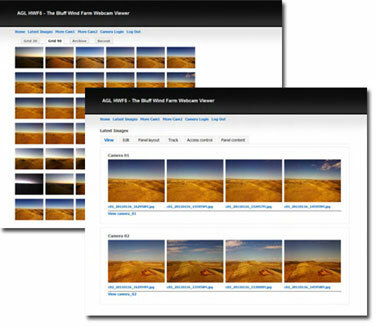 Displaying a sequence of images provides a powerful online tool at your disposal to see change through the images as they are uploaded instead of just viewing a single image of the current view. All images uploaded to our web servers can be downloaded via your cPanel Web Hosting Interface. You have full access to download the raw images and all media uploaded to our servers belongs to you. We will also backup your data to offline storage for long term data retention to keep online storage space available. All data stored on our offline servers remains solely your property and is available by request free of charge. We do not just provide hardware, but aim to provide you with a complete solution consisting of industrial remote camera system hardware as well as premium web hosting with a stand alone customisable image viewing web platform for a full function online package that is easy to install and customise remotely to maximise your return on investment. There are no restrictions on system configuration, you can utilise our included hosting and web platform solution or you can configure the systems to your own requirements and utilise your own online infrastructure. We are specialists in remote camera system hardware and highly experienced in web development and custom online solutions. We can customise our solutions for large corporate organisations and government departments as well as cater for international client requirements. Anywhere, anytime, this Solar Powered Wireless 4G Internet IP Camera System can be installed easily and quickly and is dependent only on having unobstructed exposure to the sun and receiving a wireless 3G or 4G internet connection to it's location. The amazing functionality and extensive configuration versatility means the possibilities for use are only limited by your creativity and imagination. High quality 2 megapixel HD multi-stream IP camera for extreme outdoor applications. This camera boasts high definition 2 Megapixel HD (1920 x 1080 px) resolution, allowing for the delivery of highly detailed images and coverage that is 6 times larger than a standard VGA CCTV camera. This camera also includes a remotely adjustable optical lens to alter the optical zoom and focus as well as being able to utilise digital zoom. To maximize the benefit of the 2 megapixel sensor, the V2 Camera Head employs several innovative technologies for optimized bandwidth efficiency. The ePTZ function enables users to quickly move to a target area for close-up shots without moving the camera physically. Users can also receive only the portions of the images they are interested in via the cropping function. Multiple imager/video streams can be delivered simultaneously in different resolutions, frame rates, and image qualities for viewing on different platforms so as to meet different needs or bandwidth constraints. This enables digital manipulation of the live viewing stream while keeping the other streams set for active event capture. The V2 also offers activity adaptive streaming support that dynamically allocates bandwidth according to the video content and trigger state. Designed for outdoor surveillance, the V2 features auto-iris capability to protect the lens from damage induced by direct sunlight. To adapt to light changes throughout the day, the camera includes a removable IR-cut filter and IR illuminators for superior image quality around the clock. The V2 also comes with an IP66-rated housing that offers protection against rain and dust to ensure functional operation in all types of weather conditions. With other advanced features such as tamper detection, SD/SDHC/SDXC card on-board storage, and two-way audio (full duplex), the V2 is an all-in-one high definition multi-stream IP network camera for outdoor environments. Adjustable video/image size, quality and bit rate. Dual day/night profiles for brightness, contrast, saturation, sharpness, white balance and exposure control. Includes an industrial grade wireless broadband 4G-LTE modem and router with fallback to 3G as well as an external high gain base station multi-band mobile broadband antenna for improved reception strength. This system utilises an industrial grade 4G-LTE/3G wireless internet modem/router to connect to the internet. We can assist you with activating a mobile broadband data sim on the Telstra network through our recommended Authorised Telstra Mobile Dealer or alternatively you can arrange the activation of a sim card to your existing Telstra account via your own Telstra representative. For ease of setup and installation we recommend our clients to activate one of our blank Telstra sims to their account so that we can pre-install the sim and test all system functionality prior to delivery. This enables you to simply unpack and mount the system and then turn it on to achieve instnt full remote system functionality. All Australian ISP mobile data sims are compatible with our systems, although to obtain full remote access functionality it is recommended to use the Telstra Mobile Network. International customers will need to source and install a 4G/3G broadband sim card from a local provider. The multi-band modem will connect to almost all networks around the world that use the normal range of frequencies. For Australian customers we recommend the Telstra Mobile Broadband netwrok to achieve the maximum coverage, speeds and connection functionality. The cost of ongoing internet bandwidth costs are the customers responsibility to maintain separately to the cost of this system. For international customers, our Multi-Band 4G-LTE/3G Modems work in most countries. We can send detailed instructions for installing your own sim card and configuring your internet connection. We will still pre-configure your router settings as much as we can before shipping the product. Full support via phone, email and skype is included to assist you with connection setup. For full remote access functionality an internet connection with a publicly accessible IP address is required. Some mobile broadband services are setup by default with a non-public firewalled IP address, which would enable outgoing uploads but no remote access into the system. Most ISPs can provide a connection with a public IP address upon request. International clients are recommended to contact your local mobile broadband ISP to confirm the availability of a Public IP address service prior to purchase to ensure full remote access system funtionslity can be achieved. 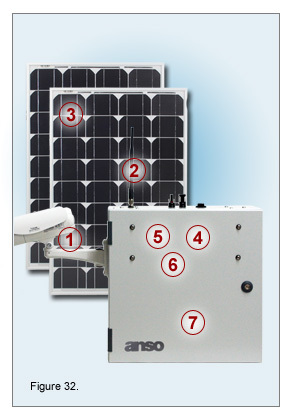 Solar charge controller with internal microprocessor providing optimal charging current and voltage. The charge controller includes 3-stage (Bulk, Absorption & Float) charging with temperature compensation ensuring correct maintenance of the internal lead acid battery and maximising the service life of the battery. The solar charge controller also includes low voltage cutoff protection to preserve the battery and to protect other system conponents from powering on below the required voltage. Our solar systems use a 12V internal power circuit which means they are very safe to use and do not require an electrician for installation or maintenance. The systems include an 8-day programmble digital timer to manage auto on/off times for system power. These monocrystalline silicon solar panels are designed for long life (up to 25 years) and high efficiency output. An excellent solution for remote or mobile power applications. Aluminium frames and tempered glass panels allow installation in demanding environments. To prevent moisture ingress, the solar cell modules are protected by a sheet of 3.2mm tempered glass. Operating temperature -40°C to 85°C. Sealed, non spillable Lead Acid Battery. System case can accommodate up to 100 Amp/Hour capacity for different usage applications. New design for easier replacement of batteries. The Commando range of systems are suitable for 24 hour day/night applications. Option available to supply system without battery. Ideal for airfreight to international customers due to the weight saving and means the shipment does not include dangerous goods for easy international customs clearance.